Promotional material for equity events on campus, including Viola Desmond Day (starting 2014). Item is a signed publicity head shot of an unidentified female entertainer. Item is a studio headshot of a woman. Dark background and deep shadows. Recto ink stamp "Kaye Starr." Verso ink stamp "This portrait through courtesy of A. Gilbert Studios, Toronto." Item is a promotional shot of a group of seven girls standing outside in the snow. Also seen in 2005.001.06.03.391. Item is an unmounted portrait of a woman in a dark dress buttoned down the front, with what lace collar and a white bonnet and big bow. Her cheeks are tinted pink. Item is an unmounted portrait of a woman in dark dress with white collar. Brooch and ring painted on in gold. Cheeks painted pink. She is sitting and one hand rests on a table and the other in front of her, on her dress. 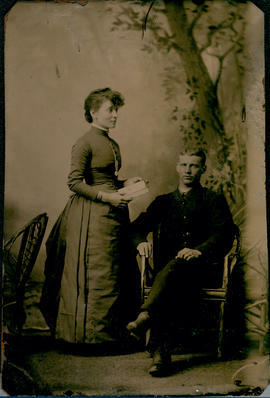 Item is an unmounted, hand-coloured tintype of a man and woman, both sitting and looking directly at the camera. The woman wears a dress buttoned down the front, with a white lace collar. The man wears a dark suit, with jacket and tie. Item is an unmounted portrait of a woman standing against a doorway.She stands somewhat informally staring at the camera. She is wearing a dark dress with white collar, and a chain hanging down the front. She wears jet earrings. 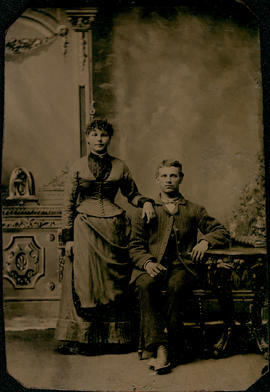 Item is an unmounted studio portrait of a man seated, and a woman standing with her hand on his shoulder. The background is simple, no colour or decoration. Armrest of chair man sits in, is fringed. Item is an unmounted group portrait of four women and four men. All four women wear hats and dresses with puffy sleeves in keeping with fashion of the 1890s. Men wear sutis with jackets and vest with chain watches. Two top corners angled off. 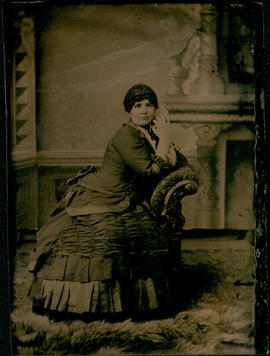 Item is a brown coloured card with overmat and photograph of a woman in a velvet dress seated on a bench in front of a window with a drawn blind. She wears a hat with sheer veil. Item consists of a mounted photograph of a large group of women in uniform positioned infront of a large building. Three men are positioned in the centre of the first row. An American flag stands behind the group. Item is a snapshot photograph of a woman in a sun hat standing on rocks by the water. Item is a snapshot photograph of a girl sitting on stairs, surrounded by other children. Item is a snapshot photograph of a woman sitting in the woods with thermos and basket on a picnic. Item is a snapshot photograph of a woman standing outside in front of a chair. Inscription on verso in black ink reads, 'caught in the middle of saying something'.